Just a 20-minute walk from Heavenly Ski Resort and 1.9 km from Tahoe Queen Saddle Road Holiday home features accommodation in South Lake Tahoe with barbecue facilities. 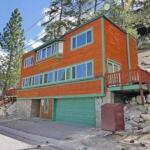 The holiday home is 3.2 km from South Tahoe Ice Arena. The 3-bedroom holiday home has a living room with TV and a fully equipped kitchen with dishwasher. Washoe Meadows State Park is 10 km from Saddle Road South Lake Tahoe while Aerial Tramway is 800 metres away. The nearest airport is Reno-Tahoe International Airport 64 km from the accommodation.